Two eastern NY farmers with Northeast Sustainable Agriculture Research and Education/SARE grants are teaming with the 16-county Cornell Cooperative Extension Eastern New York Commercial Horticulture Program to evaluate a promising way to help berry growers reduce damage by an invasive species of fruit fly. Spotted Wing Drosophila/SWD was first identified in the U.S. in California in 2008. It made its way to the Northeast by 2011 and is now a major pest of berry crops throughout North and South America. One fly can complete 15 generations in one year. By the time growers become aware of the damage, it is too late to save the crop. In 2012, SWD infested some Northeast berry crops at 80-100 percent. The eFly SWD Working Group of the North Carolina Cooperative Extension assessed the measurable loss to SWD of cultivated blueberries in 27 states in 2012 and estimates New York losses, based on a 30 percent loss of 900 acres of berries, at $1,356,000. The loss of raspberry crop value was even higher. The Northeast SARE-funded research, conducted at Hay Berry Farm, LLC, a small-scale diversified organic, you-pick berry and herb farm in Hoosick Falls, and The Berry Patch at Stone Wall Hill Farm, a larger diversified fruit and vegetables farm in Stephentown, both in Rensselaer County, is evaluating the use of netting to protect crops rather than using costly insecticidal applications. At Hay Berry Farm, a popular you-pick destination known as a ‘no-toxin’ farm, owner Lawrie Nickerson had originally planned to plant 4.5 acres of blueberries but stopped at three acres after the 2012 planting because of SWD. The use of netting there in 2013 effectively excluded SWD and other insects of similar size and larger from the trial area. “The 2013 project at Hay Berry Farm indicated that netting smaller plantings could be an excellent strategy for coping with SWD, particularly as an alternative for organic growers,” says Cornell Cooperative Extension Fruit and Berry Specialist Laura McDermott with the 16-county Eastern New York Commercial Horticulture Program. McDermott has provided technical support with project design, data collection and analysis, and outreach support to both Nickerson and Dale-Ila Riggs, owner of The Berry Patch at Stone Wall Hill Farm, where Riggs harvests all of her fruit crops for fresh, direct market sale from the farmstead, at Farmers Markets, and to dozens of regional restaurants. “Two years ago we lost 40 percent of our crop to SWD. We believe the insect was brought in by Tropical Storms Irene and Lee,” Riggs says. She estimates SWD damage cost $8000 in lost blueberry income alone. 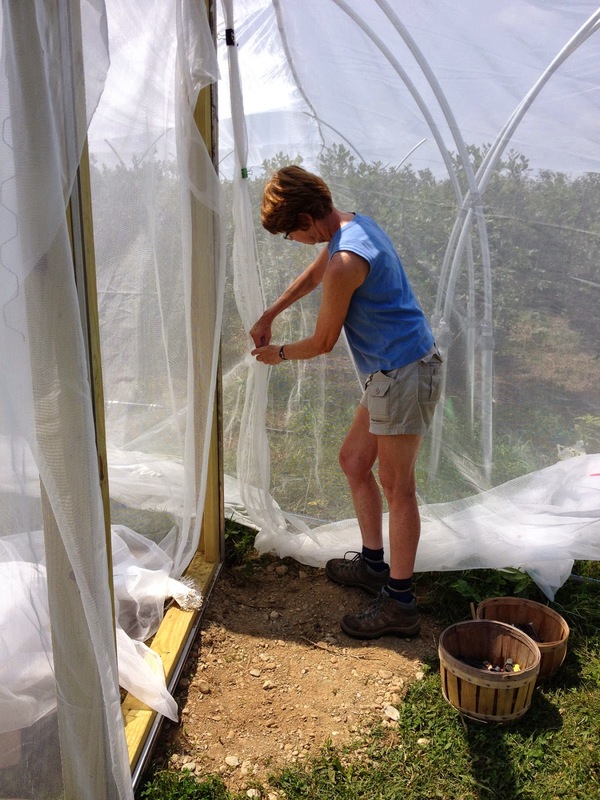 In 2014, Riggs is testing netting on a half-acre of blueberries that ripen over a two-moth period. The vigorous plants are 8-feet-tall and 8-feet-wide. She is evaluating two different mesh sizes of netting. The major portion of her planting is covered with the very fine netting Nickerson used; one row is covered with a less-fine netting that is also less expensive. “We need a system that will control SWD yet be practical for working around the berries and less costly,” Riggs says. “I am waiting to see how well the less expensive netting works at Dale-Ila’s farm. If it works well there, we will evaluate the economics and I believe there may be a strong possibility that I will put netting up next year,” Nickerson says.